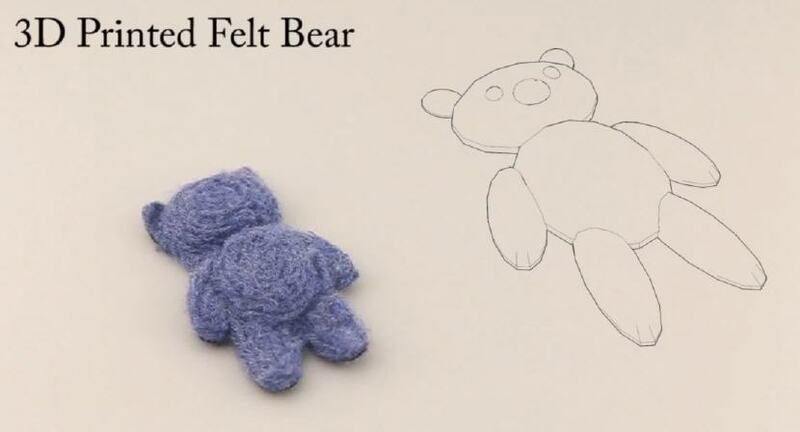 Disney Research and Scott Hudson, from Carnegie Mellon’s Human-Computer Interaction Institute, have developed a 3D printer that uses wool and yarn to create fabric objects, such as teddy bears. The 3D printer is a mix between a 3D printer and a sewing machine. The machine creates items from felt, similar to hand-knitted products. The 3D printer uses a CAD file, and prints with yarn. “I really see this material being used for things that are held close. We're really extending the set of materials available for 3D printing and opening up new possibilities for what can be manufactured,” said Hudson. A felting needle pierces the yarn and drags fibers into the layer below in order to bond the layers together. The result is not as strong as traditionally-made fabrics, and if the felt products are attached to a harder object, nylon mesh fabric must be used during the printing process for reinforcement so that the material doesn’t rip away. Currently, the printer only uses one material, but researchers are looking to combine different types of materials in one printer. “A number of researchers are looking at mixed materials in 3D printing. That's one of the most interesting challenges now,” Hudson explained.